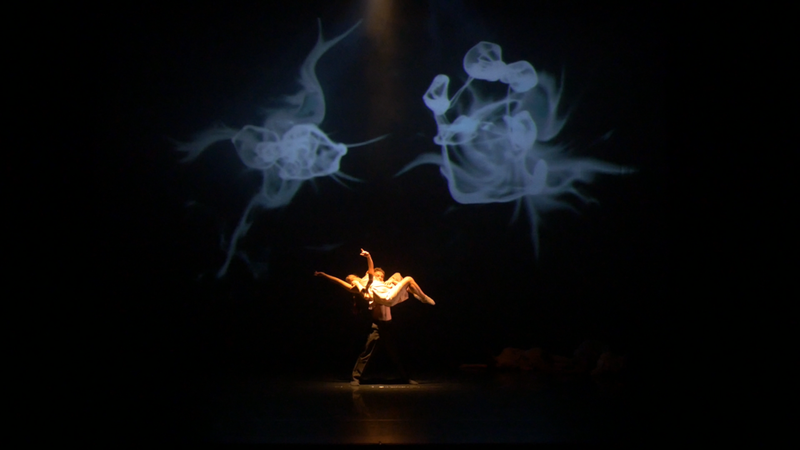 Credit: Robert Mallin was the Media and Content designer for Fear Knot / Sublime that was part of Fall for Dance presented by Dance Repertory Theatre at the University of Texas at Austin. "The words “fear knot” and “sublime” suggest contrasting states of tension and release, interspersed with lingering stillness. Fear Knot / Sublime explores the internal moments of each of these concepts, manifesting these ideas through the physical nature of dance. No matter how fleeting the moment, the tension between these two concepts and the distance that tension stretches exist as compelling expressions." All photos of Fear Knot / Sublime are courtesy of Jon Haas and Chian-Ann Lu.